When the Human Genome Project was completed in 2003, I was an undergraduate student studying animal science and biotechnology, and computer science. A new professor obtained his PhD in Bioinformatics joined our department and opened the first Bioinformatics course. I was fascinated by the richness of genetic information that was contained in such a small space. The genome seemed like the most interesting book written in a secret language to me. I joined his lab and the Bioinformatics Master’s program at the Seoul National University, South Korea. During the second year, I obtained more statistical knowledge by rotating to a Biostatistics lab. Based on the knowledge I developed a clustering method to identify gene sets with similar expression profiles in adjacent chromosomal regions with gene expression data [Jhun M et al., 2009]. In 2009, to gain a stronger foundation in quantitative methods, I joined the Biostatistics Master’s program at the University of Michigan. During this time I participated in several projects including candidate gene approaches and genome-wide association studies (GWAS) for cardiovascular diseases risk factors, in the lab of Dr. Patricia Peyser in the UM Epidemiology Department [Shen H et al., 2010; Manning AK et al., 2012; Schifano ED et al., 2012]. Based on these experiences, I decided to pursue a doctoral degree in Genetic Epidemiology at the University of Michigan to work with Dr. Patricia Peyser and Dr. Sung Kyun Park. During my PhD training, I continued to learn up-to-date skills and gained research experiences on the 1000 Genomes imputation, exome chip data, and DNA methylation chip data of GENOA study. At the same time, I continued to participate in additional GWAS and other analyses [Rietveld CA et al., 2013; Palmer ND et al., 2013; Epstein MP et al., 2015]. 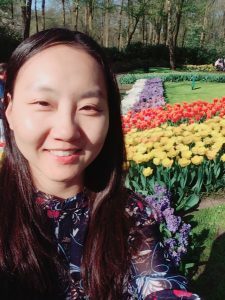 During my work, I developed an interest in gene by environment interaction and integration of different types of genetic/genomic data, which lead to my doctoral dissertation and current work. My passion is for understanding the full picture of genetic/genomic mechanisms in complex disease development and progression. The long-term goal of my research is the integration of various genetic and genomic data further in consideration of gene by environmental interactions. In addition to examining SNPs and DNA methylation, integrating other levels of regulatory components of gene expressions will provide a more comprehensive understanding of the biological pathways behind disease development and guide us closer to precision medicine.